Edge Hudson Yards Observation Deck tickets are not available online yet. It will be the highest outdoor observation deck in New York. Edge Hudson Yards Observation Deck is due to open in 2020. The 100th floor of the 30 Hudson Yards building will be home to the viewing platform. At 335 metres above ground, it is one of the highest viewing points in New York City, and certainly the highest outdoor viewing point. If you visit the Edge Hudson Yards Observation Deck, you’ll get a 360 degree view over New York. However, if you suffer from vertigo, I don’t recommend visiting as it is outside! Surrounded by sloping glass panels that give a nice view of the surroundings. Those who dare can stand on the glass part of the floor to take a look at the world below. In addition to being a tourist attraction, 30 Hudson Yards is an office building. The skyscraper is home to some well known tenants, including HBO and CNN. If you feel like a bite to eat during your visit, or a spot of shopping after, go to The Shops and Restaurants at Hudson Yards. A large mall with seven floors of shops and restaurants. 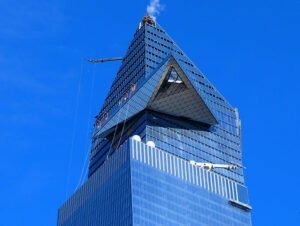 You can find 30 Hudson Yards on the west side of Manhattan, it is easy to get to, and close to subway station 34th Street – Hudson Yards. Do you want to visit another observation deck? Then get tickets for the Empire State Building, Top of the Rock or One World Observatory.